“We travel not to escape life , but for life not to escape us.” Personal travel time can be rich for the soul – visiting new places, meeting people and sharing experiences can be taken for granted when we are buzzing around all day at work. “Work, eat, sleep” can easily become a daily repetition if you don’t stop and take a moment to take life in. Check yourself into your hotel and drop your stuff off at your room. Make sure that you put some comfortable flats on if you are preparing to walk this beautiful city. Are you hungry? Me too! Head over to Lou Malnati’s “the oldest family name in Chicago” for some authentic deep dish pizza. Be ready to wait approximately 30-45 minutes for a table because this place is packed all day long. ( A good sign that I am in the right place if you ask me) The pizza is the real deal! A crispy, flaky, buttery-crust with juicy tomatoes in the center – you will not be disappointed. After lunch, if you are like me and stuffed yourself to the brim , you might want to head to Millennium Park next. The park spans a few blocks in the Chicago loop area and is filled with art sculptures, lush gardens, photography installations, fountains, and cloud gate (which I adoringly refer to as the giant silver jellybean). Walk across the fabulous snake-like bridge to the Maggie Daly Park to experience the beautiful Chicago skyline alongside all the active installations for children and rock climbers. In the same vicinity you can also find the Art Institute of Chicago, Buckingham Fountain, Navy Pier, and even the Shedd Aquarium to explore. For dinner, if you are feeling adventurous – wander a bit away from the center of the city into Wicker Park. It is a much more laid back and hip area for drinks and dinner. Start your night off at Blue Line Lounge and Grille. It is a cute blue railroad car turned diner-like lounge where you can have some bar nosh and play board games. (Try the angry chicken rolls – they are yum!) For dinner – head over to Big Star right across the street for some delicious tacos and drinks. You can order the street style tacos piece by piece and build your own assortment to enjoy. Don’t skip getting an order of the chips +salsa + guac. The chips have a dash of lime on them that will keep your hand reaching back into the basket again and again for more. Outdoor seating was a must! Finish off the night at Flat Iron right around the corner from Big Star. The bar was filled with graffiti artwork all over the walls, billiard tables and a shuffleboard table. Here I played my first game of shuffleboard and won! Must be beginner’s luck! Find a wonderful place for breakfast, and then take a walk through the Palmer House Hilton Hotel. It is a step back in time to the roaring 20’s with a grandiose gold gilded lobby, a jaw dropping painted ceiling and opulent chandeliers designed by Tiffany and Co. When traveling – I always try to learn about the city if I can help it. I highly recommend taking a River Boat Cruise with the Chicago Architecture Foundation. Learn all there is to know about the architecture of the buildings that line the river during the 1.5 hour cruise. It is definitely worth it and your photos will be magnificent. Make your way back towards North Michigan Avenue and find yourself a Chicago hot dog. What makes a Chicago hot dog? It is an all-beef frankfurter on a poppy seed bun. I think that the bun is key because you notice the difference right off the bat. My mister and I wandered our way into a place called America’s Dog. Even though it felt more like a franchised place, the hot dogs were still as delicious. A few blocks up on State Street, you can find some of the national retail stores such as Zara, The Gap, and H&M. When traveling I prefer the local boutiques to the mass retailers – but sometimes a girl just wants to shop! I found some great additions to my wardrobe at the Burlington Coat Factory and Nordstrom Rack and cannot wait to share those soon. Where to for dinner? We went to the most wonderful place with our family that live locally and it was definitely a hidden gem. Piccolo Sogno is approximately a 10 minute cab ride from downtown and fabulous. If you can get an outdoor table – do it. It is like sitting in the back yard of an italian villa and having someone’s family host you. You forget for the time you are there that you are in the hustle and bustle of Chicago. The menu consisted of lamb t-bones, orrechiete pasta, branzinos and delectable desserts – so save room! Are you tired yet?! lol So much to do and yet it feels like it hasn’t been enough. Walk over the river and go grab breakfast at Lou Mitchell’s Restaurant. This place has been around forever and as soon as you sit down you get a miniature box of Milk Duds. I love old school candy and this made my day. Also, make sure to order their famous skillet omelettes or try the corned beef hash. There is orange marmalade on the table that you must taste! 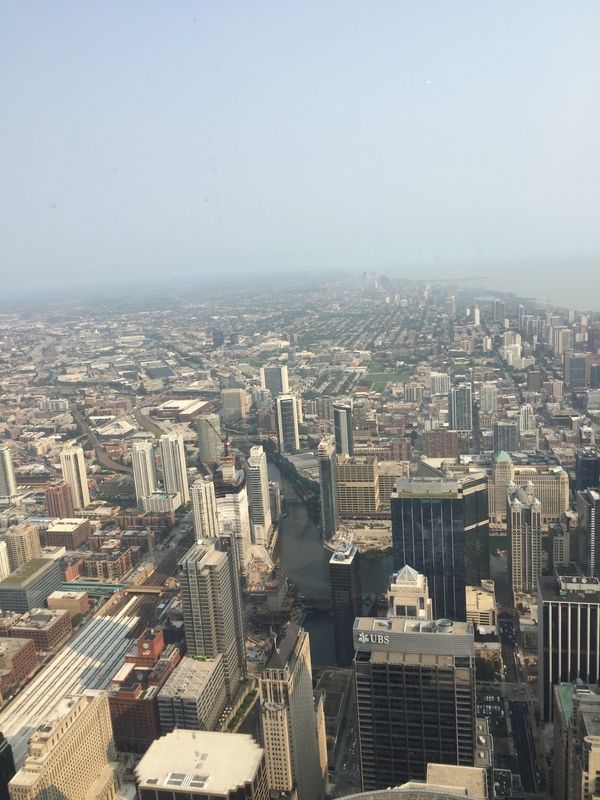 Following breakfast – immediately head over to the Willis Tower (formerly known as the Sears tower) which used to be the tallest building in the world! (#1 is now the World Trade Center) and make your way to the Sky Deck entrance. If you get there early in the morning, the line and wait isn’t so bad. We were on the Sky deck top floor in less than 15 minutes. According to some reviews I saw – the wait could be as long as three hours!! Take a picture on the Sky ledge that stands out over the city if you dare. If you are like my mister, one cup of coffee is never enough. Swing by Intelligentsia – a fresh roasted coffee bistro where your iced coffee is made pour-over style and you can order other drinks such as a ginger plum iced tea. The staff is clad in hipster plaid shirts with suspenders and ties. There are seven total locations in Chicago and they are highly rated. Have a seat and enjoy your drink! 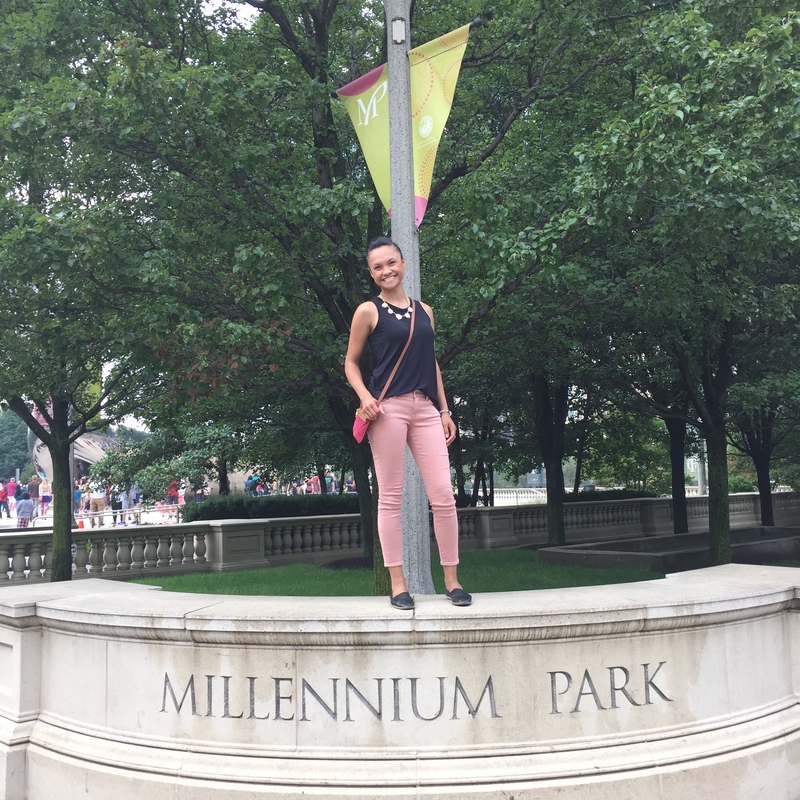 Prior to leaving for the airport we took one last farewell stroll through Millennium Park. We stopped at the outdoor bar to toast to the weekend. The Plaza (the bar we stopped at) is an outdoor bar located in the park only during the summer months because in the winter it is transformed into an ice skating rink. How cool right? I can’t believe that the trip went by so quickly. If I missed any of your favorite places – let me know! I cannot wait to go back and visit soon. Thanks so much for reading. @Sydneyonthego Thank you so much! That means the world to me. I try to enjoy as much of what each city has to offer. If you have any other suggestions – please let me know. I would love to plan another trip back to Chi-town! Palmer House was an absolute delight as well – I would definitely stay there again. As a Chicago native, you’ve definitely covered the must-sees – and also the hidden gems like Palmer House! Ting Ting that’s so awesome! I hope that you are able to take some time to see the sights. Its a beautiful city. Enjoy!